This blog follows on form some of the ideas in my previous two blogs, which highlight the problems of mind-body dualism and the usefulness of a biopsychosocial model which incorporates ontological depth. 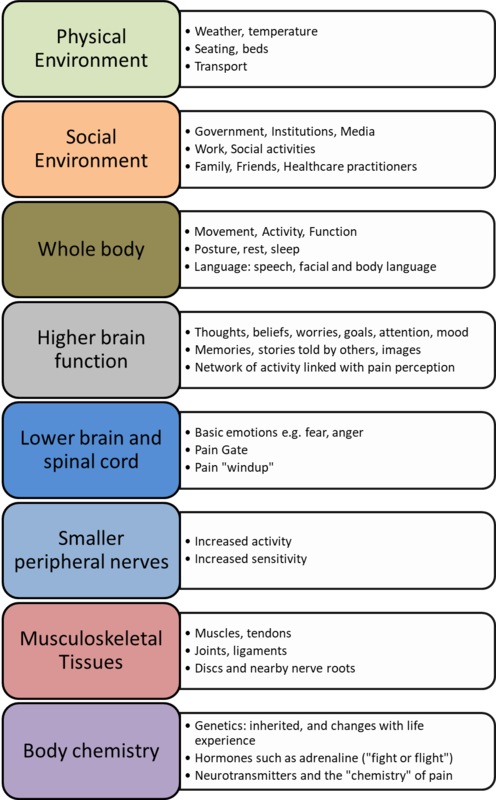 I have included below an A4-sized copy of a multilevel model of pain which I’m currently using with some patients within the Pain Service to explore some of the complex interactions which can be influenced to improve somebody’s outcome. It’s not suitable for everyone, but it has sparked off some interesting discussions with patients who wanted to understand more about pain. In particular, it seems to be helpful for people who have followed a purely biomedical model, and ended up struggling with a reductionist way of thinking about pain. A purely biomedical model focuses on identifying an impairment (a fault with a structure or its function) which is leading to disease. The patient presents to a healthcare practitioner with symptoms, the practitioner takes a history, examines to elicit signs, and arranges any necessary investigations. This information is all collated to form a diagnosis, which then guides the treatment, which is focused upon fixing the fault. This is a model which most of us grew up with, and were probably trained in. Our patients are of course also used to it, and often expect us to be working with them to identify the broken part (the “Find It and Fix It” approach). I work in a secondary care Pain Clinic, so I meet a number of patients who have persisted with this way of thinking, but it has not led them to a successful outcome. Sometimes they are well aware of this themselves, and may have reached an understanding that they are not really expecting a cure. However, sometimes the “Find it and Fix It” approach is still their main aim. I may therefore spend a few minutes exploring these interactions using the multilevel model, and this seems to have helped a number of people to broaden their view of pain management to incorporate a number of other strategies. The model makes reference to a number of domains which we know are relevant to the operation, development and prognosis of a pain problem. It is structured in a broadly hierarchical way, with smaller scale domains at the bottom, and larger scale domains at the top. This doesn’t mean that any one domain is more important than any other: they are all operating at once, and one domain may for a time be more relevant for an individual than another domain. 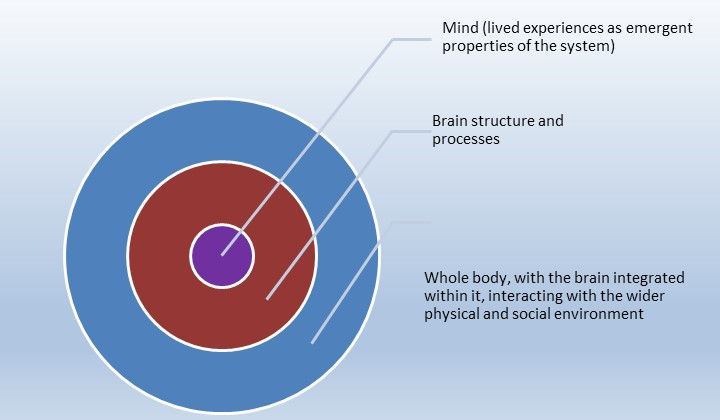 The model is consistent with a biopsychosocial model, with Louis Gifford’s Mature Organism Model, with the World Health Organisation International Classification of Functioning, Disability and Health (ICF), with a General Systems approach, and with Critical Realism, which is a “metatheory” which I used as a basis for my PhD. So, I don’t think there’s anything new in this way of organising ideas, but it does allow me to discuss quite a few issues with patients, all of which fit onto a sheet of A4 paper. Critical Realism is one of a number of “integrated theories” which argue that we shouldn’t just be focusing on one domain of reality in order to make sense of what’s happening in the world. It suggests that reality is structured in a hierarchical manner, for example that psychological events are built on a foundation of biological events, which are at a smaller scale built on chemistry and below this, physics. This isn’t in itself a new suggestion, but it links to other interesting ideas. Firstly, it argues that biological events “underdetermine” psychological events: in other words, that our thoughts and feelings depend upon neurobiology but are not completely determined by them. This is an idea which is often called “emergence”: in plain English, this means that “the whole is greater than the sum of the parts”. There is a practical relevance to emergence: a burst of adrenaline (a biological event) may lead to a change in our thinking and emotions which may lead to a change in our communication with others and our behaviour. However, we interact with others and our environment at a different level of reality from the chemical level: somebody experiencing heightened adrenaline may end up running out of a supermarket, or scoring a goal if they happen to be playing football. All of these events are not just determined by neurobiology, but neurobiology is foundational to these events. What actually happens is strongly dependent upon context. A further consequence of this way of thinking is that activity at one level can influence events at another level, with mechanisms acting which may not be immediately obvious. Clinically, I use this diagram to discuss with patients how, for example, a “significant other” not taking their pain seriously may affect the patients’ thoughts, which may in turn affect their autonomic nervous system, muscle tension, emotions, etc. It is easy to draw arrows on the table which link up these areas: each of these arrows represents a mechanism, a way in which events at one level of reality can influence events at another level. I did this once with a group of patients, and they were able to draw many arrows on the diagram, which immediately represents a complex system with interactions which patients recognised as “vicious circles”. Once our patients are clear about the nature of these complex interactions, it is easy to understand why we would not expect a strong correlation (measured on a population level) between abnormalities in the tissues, and pain itself. However, partial correlations are still important within a systems approach: we shouldn’t overlook weak correlations if they are part of a broader, interactive model which is, taken together, a more explanatory one. It may be that they lead us to explore whether a combination of other factors (such as genetic factors, diurnal variations in cortisol levels, nerve root irritation, catastrophizing, poor sleep and reduced activity) which when combined together make a better model. This would require researchers from different specialties to collaborate to understand the emergent properties of complex systems that end up with suffering and disability. This entry was posted in Uncategorized on June 29, 2017 by Pete Gladwell. In a previous blog, I discussed the philosophical model known as dualism, and the problems that we can end up with if we try to use dualism to understand complex health problems. The blog also highlighted the usefulness of philosophy for physiotherapists. This current blog will aim to describe how to move from dualism towards a more useful Biopsychosocial Model, using plenty of plain English, an occasional philosophical term, and the aid of Microsoft SmartArt. It will keep up the theme about the potential for insights into how we think (philosophy) to enhance physiotherapy care. If you read the previous blog, you will remember that Descartes put forward the idea that the body was like a machine, which could be treated like a piece of clockwork. To understand health problems, all we needed to do was to take the body apart, find the “broken part” and fix it. Dualism represents the mind (or the soul) as a separate thing altogether, with only a weak connection to the body. Dualism encourages us to sort health problems into either physical problems, or problems with the mind. Dualism also allows us to think that physical health problems are “real” and that mental health problems are “imagined” or “all in the mind”. This is a very unhelpful way to think about our health, as was discussed in the previous blog. An alternative approach (or model) was put forward in 1977 by Dr George Engel. This way of thinking is known as the Biopsychosocial Model, and it has been very influential within healthcare. I will explain more about some aspects of the model later on, but first I will outline some ways in which it has been misunderstood. Unfortunately, Engel’s rather complex ideas have been oversimplified over the years. Some people have (mis)understood the Biopsychosocial Model to just be about collecting separate sets of information about the biological, psychological and sociological factors which affect health problems. This overly simple understanding can still allow us to make the mistake of categorising health problems as either biological problems, psychological problems, or social problems. So instead of the two categories of dualism, this overly simple Biopsychosocial Model gives us three categories: perhaps we should call this “Trio-ism”? I’m going to introduce a key philosophical term here, to describe this 3-segment model. The key term is “ontology”, which is a word used to describe statements about how reality is structured: “the kind of things that exist, the conditions of their existence and the relationships between these things” (Blaikie 2007). Basically, it is a description of what people think reality is like. For example, thinking that the Earth is flat is an ontological belief. Similarly, thinking that the Sun revolves around the Earth is an ontological belief. They are both ontological statements that most people now see as inaccurate, even though they used to both be widely held. I think that the simple 3-segment Biopsychosocial Model shown above is also a mistaken ontological belief, and it can lead to misunderstandings about health problems. This way of representing the 3 segments is known as a “flat ontology”, and I will compare it now with a model which has “ontological depth”, or is “ontologically stratified”: in plain English, it has layers. The idea that reality is “layered” has been around for a long time, but it has been developed by a philosophy known as Realism, and in particular a branch of Realism known as “Critical Realism” which has been influenced by the thinking of Roy Bhaskar (Bhaskar 1975, Collier 1994). Realism and its’ ideas about stratification can be helpful to understand complex health problems, as they don’t fall into the trap of categorising health issues as only biological, psychological or social problems (Bhaskar and Danermark 2006). 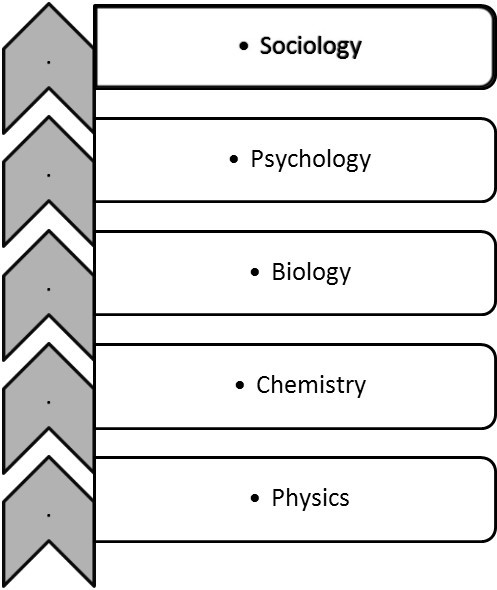 Ontological stratification (or layering) suggests that many scientific domains have another level of scientific study “below” them. For example, it suggests that biology cannot be fully understood without understanding chemistry. It goes further, in suggesting that biological organisms couldn’t exist without the ‘building blocks’ which chemistry studies. Similarly, it suggests that chemistry cannot be fully understood without understanding physics. Again, it suggests that molecules couldn’t exist without the ‘building blocks’ which physics studies. Realism is very clear in saying that a good grasp of physics doesn’t allow us to confidently predict what will happen when we start to study molecules. Similarly, Realism argues that understanding chemistry won’t tell everything we need to know about living organisms. Realism has a specific word for this: “underdetermination”. One of the consequences of underdetermination is that studying each layer and the interaction of events occurring at all layers is necessary for a complete understanding of what is happening. This means that we cannot be “reductionist” and at the same time have a full grasp of what’s going on in the world. Reductionism is a tendency to look only at smaller and smaller components in order to understand how things work. Reductionists think that the answers to all of our questions can be found by looking “down a microscope”, by “moving down a layer”. There are helpful consequences which come from understanding the world using a stratified model like the one shown above. Firstly, it reminds us that psychology (the study of thoughts, feelings and behaviour) “depends upon”, but is not fully determined by, events at a biological level. Of course, without biological human brain activity, there would be no human psychology to study. However, we should not expect the study of biology to explain everything about human experience. For example, we have a reasonable understanding of the changes which take place in the body when people are put under acute stress: the “flight or fight” response, as it is known. We could for example measure a person’s cortisol and adrenaline levels, their blood pressure, their breathing rate, and muscle tension: but none of this would tell us what the person’s next behaviour would be. That would depend to a large extent on the person’s situation, because whether they are playing rugby, doing a driving test, going to war, or riding on a rollercoaster will influence the behavioural outcome of all these biological mechanisms. We therefore need to understand their social and physical context in order to understand behaviour. Ontological stratification reminds us that a full understanding of the world requires an understanding of all of the levels, and the interactions between levels. Moving down an ontological level may sometimes provide us with answers about “how” change happens (mechanisms) but we may need to move up an ontological level to fully understand the role of context in shaping the operation of these mechanisms. If we ask whether the “fight or flight” response is biological, psychological or social we are asking the wrong question. We are trying to categorise a process which crosses all of the categories. This is the same mistake that we can make when we try to categorise common health problems such as back pain, heart disease, Chronic Fatigue Syndrome/ME, diabetes or cancer as either biological, psychological or sociological in origin. Having explored ontological stratification, if we now return to Engel’s initial ideas about the Biopsychosocial model, we can avoid overly simplistic “Trio-ism” just as we can avoid the pitfalls of Dualism. Engel suggested that we could use General Systems Theory and nested models to understand health. I’ll use a simple example to explain how this model works. A person is sitting in a bar on holiday, with a glass of their favourite wine on the table in front of them. This describes their physical and social situation, but it doesn’t tell us how they might feel or what they might be thinking. Now they take a sip of their wine. The volatile chemicals in the wine enter their nostrils and stimulate the olfactory system. The liquid enters their stomach, then the alcohol enters their bloodstream, and crosses their blood-brain barrier. So far, this is a description of biology: but what did they experience as they smelt and tasted their drink? How might the alcohol affect their experience as they drink more? Whilst their experience is dependent upon biology, which again is dependent on brain chemistry and its’ relationship with the alcohol, the experience itself it is not simply determined by these factors. Their “lived experience” is more complex: it can be thought of as an “emergent property” of the entire system, dependent upon all of the elements in the system but not explainable by looking at the parts alone. How might their experience be different on the first, or last, evening of their holiday? This is a “nested” model, as suggested by Engel: a “Biopsychosocial model” of drinking a glass of wine. If we need a stratified biopsychosocial model to understand a holiday drink, we certainly need one to understand health and illness. Bhaskar, R. and Danermark, B. (2006) Metatheory, Interdisciplinarity and Disability Research: A Critical Realist Perspective. Scandinavian Journal of Disability Research. 8 (4), pp. 278-297. Blaikie, N. (2007) Approaches to social enquiry. Cambridge, Polity. This entry was posted in Uncategorized on January 2, 2016 by Pete Gladwell. The Pain Training and Education (PTE) courses have been developed over many years, and have always had a close association with the Physiotherapy Pain Association (PPA). The PPA’s Study Day titled “The Biopsychosocial Assessment of Acute Low Back Pain” was delivered in June 1997 by various speakers. Subsequently, in response to feedback and demand from PPA members, Paul Watson and Heather Muncey went on to develop a one-day course teaching physiotherapists how to use a systematic biopsychosocial assessment process. This study day was then delivered by Heather and Paul for the PPA and other organisations, on several occasions over the next few years. Heather invited me to take on a role in the delivery of this course in 2001. The next stage in the development of PTE courses was the delivery of another PPA study day, in 2003, by me and Heather Muncey. This was titled the “Cognitive Behavioural Approach to Physical Therapy for Beginners”, and introduced physiotherapists to key cognitive and behavioural methods which can be integrated within physiotherapy-led rehabilitation. The course was popular, and was delivered by the two of us in a number of venues in the UK, and also in Australia. Both of the above study days were one-day courses, and the next logical step was to combine them into a two-day course which moved from biopsychosocial assessment into the development of a treatment plan integrating cognitive and behavioural approaches. This two-day course was well received when it was first delivered at the University of Southampton in 2004. Heather Muncey and I continued to deliver this two-day course for the next four years, and we took on the name of “Pain Training and Education”. We also co-delivered a more advanced two-day course, in collaboration with Prof Frank Keefe, Professor of Psychology and Neuroscience at Duke University, which was delivered in 2005 and again in 2006. Heather and I then became involved in other projects (the development and evaluation of a pain Self-Management Programme, and a Ph.D., respectively) which left little time for teaching. The next step happened when the Physiotherapy Pain Association reviewed their educational strategy in February 2011, and identified a clear need for an introductory course in biopsychosocial assessment and cognitive behavioural management, suited to the needs of physiotherapists working in musculoskeletal outpatient settings, pain clinics and pain management programmes. It was apparent that the knowledge and skills that such a course should cover were an identical match to the two-day PTE introductory course. This was perhaps unsurprising, as the course was designed for PPA members in the first place, and had been refined by Heather and I by responding to the helpful feedback from course delegates over many years. PTE and the PPA agreed to collaborate in the delivery of the courses, and the first two-day “introduction to the cognitive behavioural approach to the management of pain” course was delivered for the PPA in September 2012. Heather Muncey had by this time retired from clinical work, and had also decided to step back from her teaching role. Emma Bartlett was able and ready to take on the vacancy left by Heather, and every PTE Introductory course since has been delivered by Emma and I. We try to deliver the course in different venues around the UK, and have so far taught in London, Huddersfield, Bristol, Liverpool, Glasgow, and Nottingham. The PTE courses have been shaped by feedback from delegates over many years, and a consistent message from a number of physiotherapists in recent years has been a desire for more teaching about managing pain-related insomnia. PTE were very pleased to deliver the first “Pain and Sleep – Managing the Interactions” course in March 2015, delivered by Andrew Green and Alex Westcombe. They were co-editors of “Sleep: Multi-Professional Perspectives”, and Andrew has co-edited a second book, “An Occupational Therapists Guide to Sleep and Sleep Problems”. The course was very well received, and we hope to deliver it again in the future. This entry was posted in Uncategorized on April 16, 2015 by Pete Gladwell.